Some of us might like frantically typing our notes on a keyboard, and some might even like typing on a touchscreen, but it's not always the most convenient way of taking notes. Some of us prefer to write notes via the good old pen and paper combo, which while fast and portable, can prove to be a pain when you need to type up those notes onto a computer. 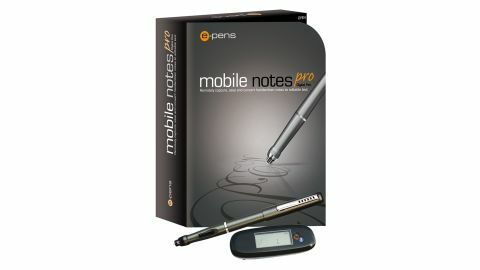 The E-Pens Mobile Notes Pro digital pen is a great combination of old and new ways of taking notes, since you can use the pen to write notes on a pad of paper, and then wirelessly send your notes to your PC. Included OCR software can convert your writing into editable text on your PC, that you can then work on in Microsoft Word and other applications. The kit comes with the electronic pen, batteries, ink cartridges and a base unit that clips on to the top of a sheet of paper. The base unit records your pen strokes, and then stores them until you connect it to a PC via Bluetooth or USB. The software that comes with the pen is basic, but there were no problems uploading our notes to our PC. They appeared just as we had written them. However, when we tried turning the writing into editable text, the required plug-in stopped responding. We're running Windows 8, and tried the compatibility options, but still the add-on crashed. You can also use MyScript Notes to translate the text, which worked but needs an activation code.